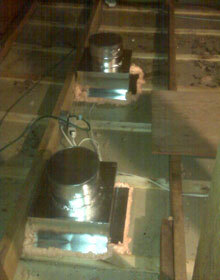 The attic is often the most poorly insulated and ventilated area of your home's envelope. 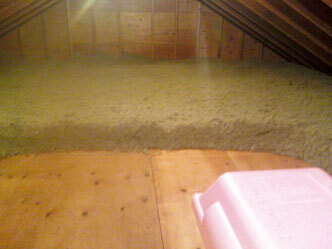 Insufficient insulation levels in your attic can result in major heat loss and thus, higher energy bills. Furthermore, poor ventilation and air leakage are major contributing factor for ice dams and mold growth. The walls of many homes are also poorly insulated and lead to heat loss, as well. RetroFit Insulation uses high quality Rockwool or cellulose insulation for insulating home attics and walls. Rockwool or cellulose insulation's formaldehyde-free properties make it cleaner to install and safer for the environment. 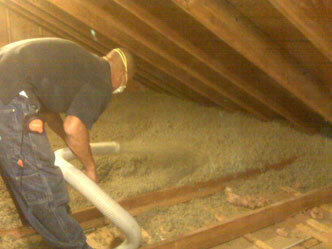 Attic and wall insulation is part of a complete system to keep your house cool in the summer and warm in the winter. Most customers choose to upgrade to either R38 or the maximum recommended by the Department of Energy - R49. Our current southeastern MA & eastern RI service area includes the southern New England communities of: Fall River MA, Somerset MA, Swansea MA, Westport MA, Westport Point MA, North Dartmouth MA, South Dartmouth MA, Seekonk MA, New Bedford MA, Acushnet MA, Fairhaven MA, Mattapoisett MA, Marion MA, Wareham MA, Carver MA, Middleboro MA, Rochester MA, Freetown MA, East Freetown MA, Assonet MA, Lakeville MA, Taunton MA, Raynham MA, Bridgewater MA, Norton MA, Dighton MA, Berkley MA, Rehoboth MA, Plymouth MA, Brockton MA, Stoughton MA, Randolph MA, Braintree MA, Quincy MA, Boston MA, Easton MA, Franklin MA, Mansfield MA, Attleboro MA, North Attleboro MA, Providence RI, East Providence RI, Barrington RI, Warren RI, Bristol RI, Tiverton RI, Little Compton RI, Middletown RI, Portsmouth RI, Barrington RI, Pawtucket RI, Woonsocket RI, Cumberland RI, Cranston RI, Warwick RI, East Greenwich RI, North Kingston RI, Jamestown RI, Narragansett RI & Newport RI.